The Rebel Sweetheart. 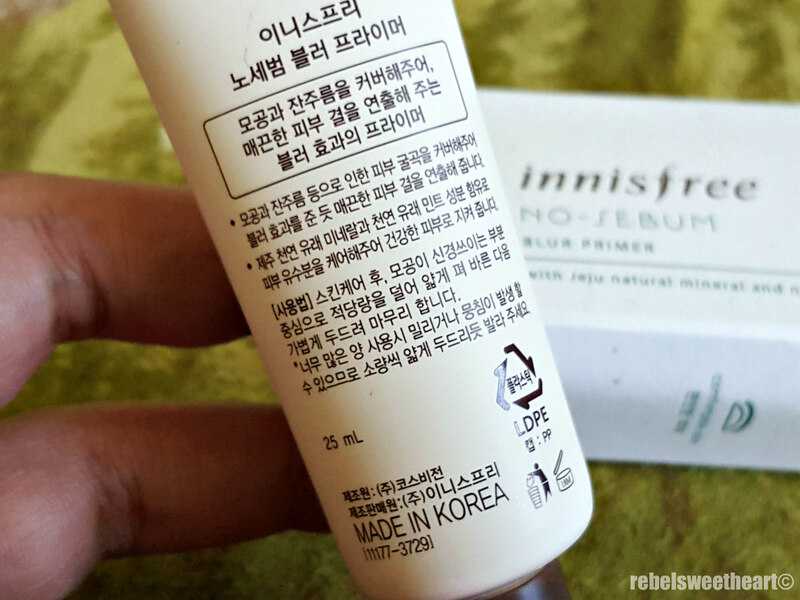 : Spotlight | Innisfree No-Sebum Blur Primer. 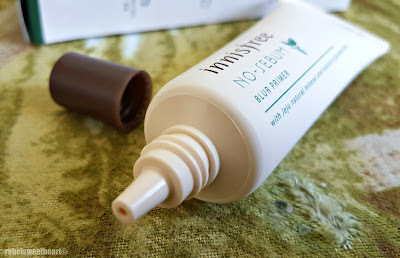 I'm a huge fan of the Korean cosmetics brand Innisfree - from their BB creams to their clay mask, to their ever-popular face mist. My only gripe, however, is that this brand is not available in the Philippines. And the only way for me to get my hands on their products is through online stores, or ask the husband to buy them in Korea. And so when I finally had the chance to visit South Korea and set foot in Myeongdong, I made it a point to shop at Innisfree to my heart's content. One of the (many) items that I bought is the No-Sebum Blur Primer. 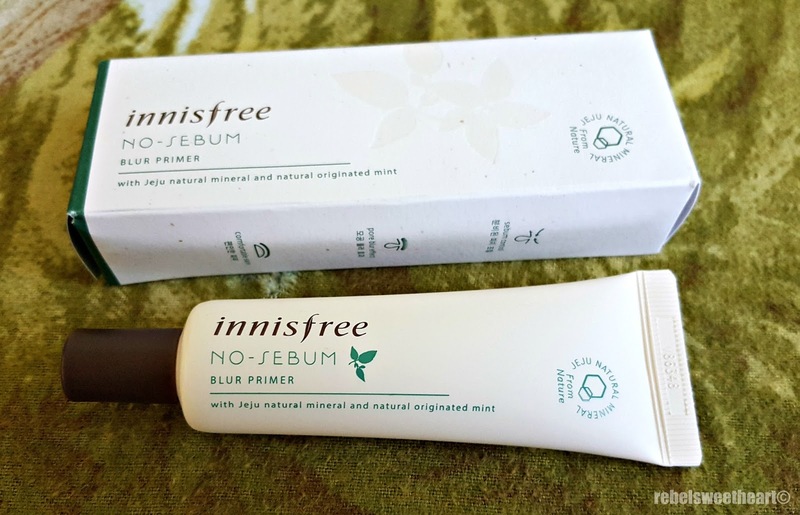 Innisfree No-Sebum Blur Primer, 10000 won. 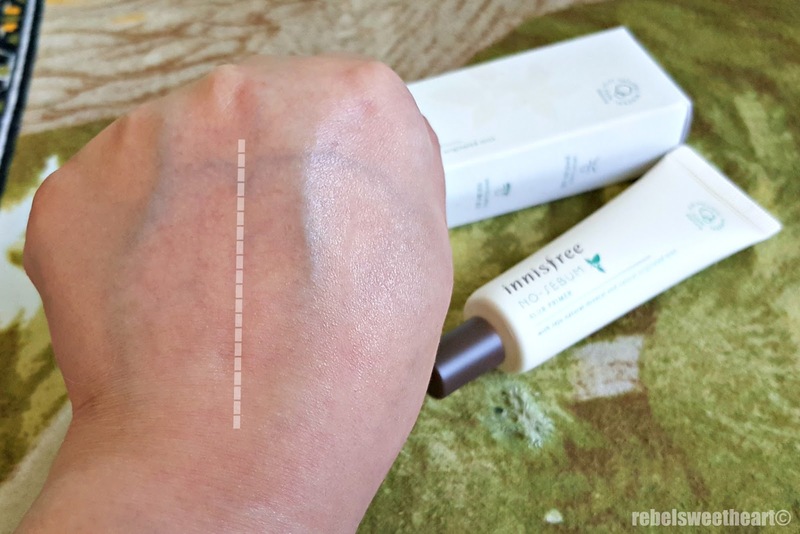 Simply put, it's a primer that makes the skin texture smooth and bright, as if giving a blur effect, covering skin bumps caused by pores and fine wrinkles. 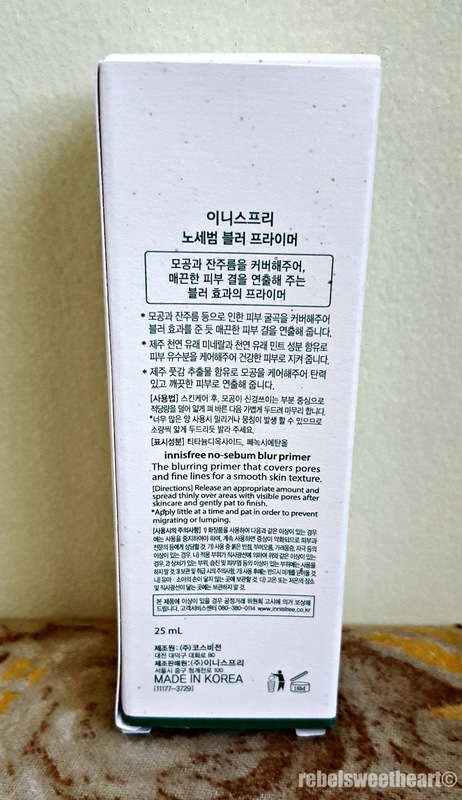 Product description in English and Hangul at the back of the box. 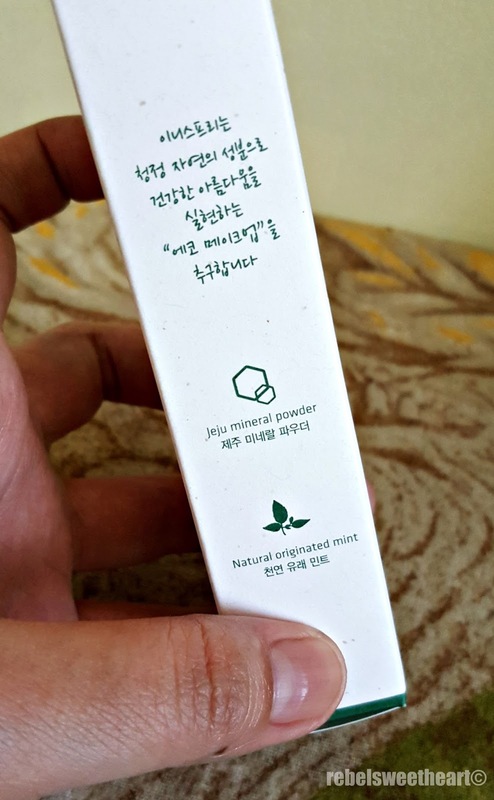 It contains 'natural mint' and 'Jeju mineral powder' to manage the oil and moisture balance of the skin, thus making the skin soft and smooth for hours. Natural mint and Jeju mineral powder. 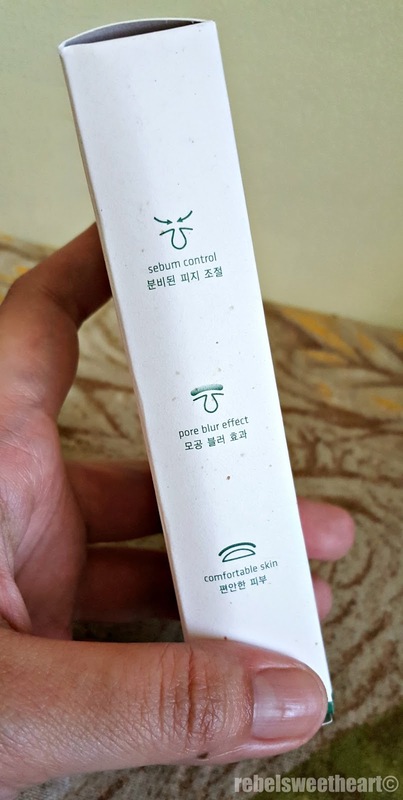 It also contains other ingredients from Jeju, such as Green Persimmon extracts which makes the skin supple and clear as it tightens the pores, and the Jeju Green Complex which makes the skin healthy and glowing. Comfortable skin made possible by natural ingredients from Jeju. The Innisfree No-Sebum Blur Primer comes in a very handy, 25 mL squeeze tube. The plastic tube is pretty easy to squeeze, and the dispenser tip allows you to control the amount of product you want to use. Product description on the tube, written mostly in Hangul. The product is beige in color and has a soft, velvety texture similar to that of The Face Shop's Velvet Skin Primer. But unlike that primer, which has a rather watery consistency, this one tends to lean more on the creamy side. Squeezed a bit of it on my skin. It has a very faint minty scent, barely noticeable, really. 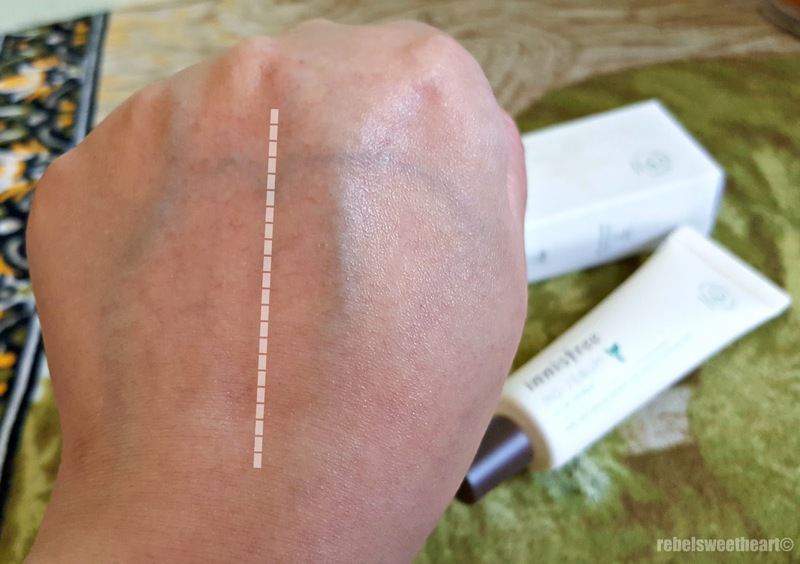 You'll only catch a hint of it when you smell the product from the tube since the scent dissipates as soon as you spread the primer on your skin. A few seconds after application. Left, without primer. Right, with primer. I love its lightweight formula, its soft, velvety feel, and how it keeps my makeup intact for hours. It does a good job of minimizing the appearance of fine lines and neutralizing the red patches on the skin. 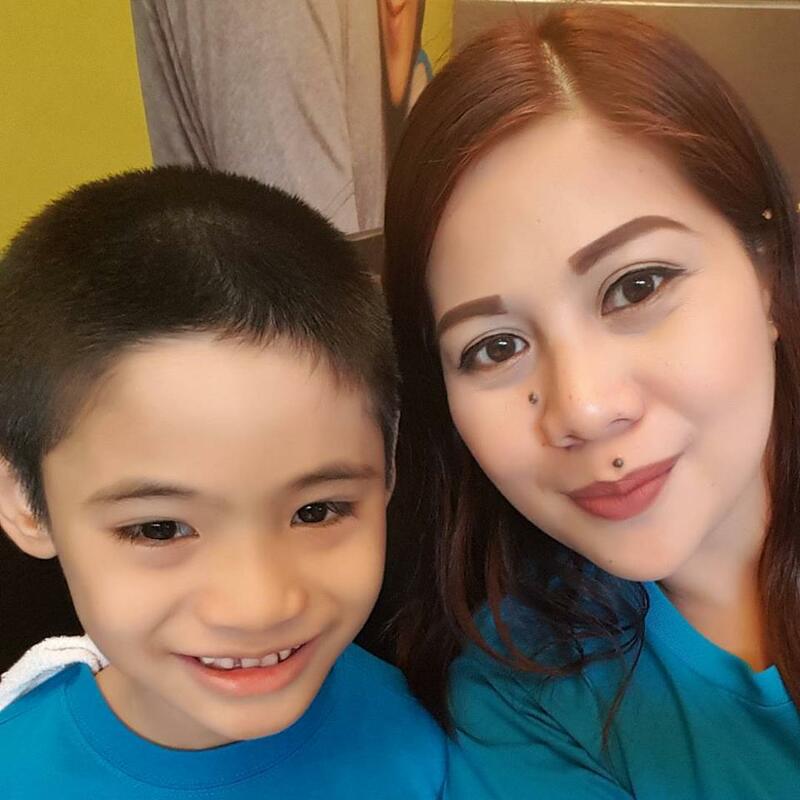 Plus its mattefying effect is perfect for this time of the year (ergo, the scorching hot summer months in the tropics). And while this product may be silicon-based, it had no adverse effects on my skin - no itchiness, no rashes, no breakouts whatsoever. Left, without primer, Right, with primer. - Conceals fine lines, smoothens skin. - It is silica-based, so take caution if you're allergic to silicon. Wearing the Innisfree No-Sebum Blur Primer underneath my makeup. Some of the Korean products really seem better than other types. A lot of times their marketing is more toward women young than I am. I don't use a lot of make up, only eye liners and lipsticks, so I'm not quite familiar with this. But it's evident how effective this product is, that's really awesome! I have never used a Korean brand or primer for that matter on my skin lol. 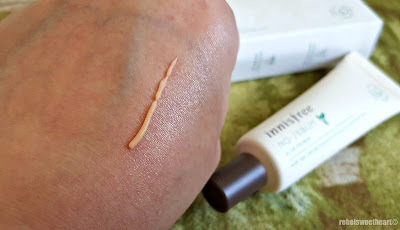 Yet this Innisfree sounds absolutely wonderful. innisfree products are very great, so glad you shared this, I'm gonna try this one. I love finding new and unique brands. That blends very well also! I love trying out beauty products that give you great results & these Innisfree products sounds really like a great choice to go with. I would love to use that primer for sure. Sounds like a great product for my skin and I love using Korean products too.